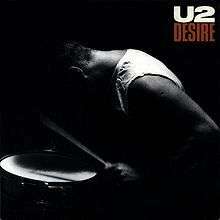 "Desire" is a song by U2 and the third track on their 1988 album, Rattle and Hum. Released as the album's lead single, "Desire" was the band's first number-one single in the UK and Australia. It reached number three on the Billboard Hot 100 in the U.S., and topped both the Modern and Mainstream Rock Tracks charts, the first song to reach the top of both of these charts simultaneously. It reached number two on the Dutch Top 40. In 1989, "Desire" won the Grammy Award for Best Rock Performance by a Duo or Group with Vocal. The band cite the Stooges' song "1969" as the primary influence on "Desire," which is an interpolation of the Bo Diddley Beat. "Desire" debuted live on the first night of the Lovetown Tour on 21 September 1989, and appeared at almost every concert on that tour. It segued into a cover of Bob Dylan's "All Along the Watchtower," and the Lovetown performances of this song are considered by fans to be far superior to the one found on Rattle and Hum. On the Zoo TV Tour, "Desire" was re-invented with different effects on the Edge's guitar, and it opened most encores. Bono would use the song to accentuate characteristics of his onstage alteregos Mirrorball Man and MacPhisto. On the PopMart Tour, Bono and the Edge would play the song acoustically. For the Elevation Tour, it was a stripped-down electric version played at the tip of a heart-shaped walkway that extended into the audience. Adam Clayton would join in with bass just before the bridge, and Larry Mullen, Jr. played along on a single drum. On 15 October 2004, at an appearance on British television promoting the How to Dismantle an Atomic Bomb album, Bono and Edge performed a rough electric version. On the Vertigo Tour, "Desire" was not played at all on the tour's first three legs, and appeared just once in an acoustic form on the fourth leg in response to a fan's request in São Paulo. It made a full electric debut at the beginning of the fifth leg at the second show in Sydney; this performance was ramshackle and it was refined before appearing at four subsequent concerts. "Desire" was played sporadically during the U2 360° Tour tour, usually played in a semi-acoustic form. On one occasion, it was combined with Bruce Springsteen's "She's the One." It has been played semi-regularly on the Innocence + Experience Tour during their b-stage set, often with Bono bringing someone from the crowd to play guitar with the band. "Desire"'s B-side "Hallelujah (Here She Comes)" has never been played in full live by U2 but was debatably snippeted once during "Bullet the Blue Sky." "Desire" has appeared on two U2 compilation albums, The Best of 1980-1990 and U218 Singles. An early version of the song appears in the form of a studio performance in the Rattle and Hum film. "Desire" has furthermore appeared on Zoo TV: Live from Sydney (as a bonus track from a different concert), PopMart: Live from Mexico City, Elevation 2001: Live from Boston, and U2 Go Home: Live from Slane Castle, Ireland. The music video for "Desire" was filmed in Hollywood, California. It is the Hollywood remix version of the song, with band members and local people in assorted places in the city, supplemented by random images pertaining to references in the song. ↑ Graham, Bill; Van Oosten De Boer, Caroline (2004). U2: The Complete Guide to Their Music. Omnibus Press. ISBN 0711998868. ↑ Stokes, Niall (2005). U2: Into The Heart: The Stories Behind Every Song. Da Capo Press. p. 81. ISBN 1560257652. ↑ Kootnikoff, David (2009-12-30). "U2: A Musical Biography". ISBN 9780313365232. ↑ "U2 East Rutherford, 2009-09-23, Giants Stadium, 360° Tour - U2 on tour". U2gigs.com. Retrieved 2014-03-30. ↑ "Australian-charts.com – U2 – Desire". ARIA Top 50 Singles. ↑ "Austriancharts.at – U2 – Desire" (in German). Ö3 Austria Top 40. ↑ "Ultratop.be – U2 – Desire" (in Dutch). Ultratop 50. ↑ "Search Results: Desire U2". RPM. 1 October 1988. Retrieved 25 November 2009. ↑ "Lescharts.com – U2 – Desire" (in French). Les classement single. ↑ "Musicline.de – U2 Single-Chartverfolgung" (in German). Media Control Charts. PhonoNet GmbH. ↑ "Nederlandse Top 40 – U2 search results" (in Dutch) Dutch Top 40. ↑ "Italiancharts.com – U2 – Desire". Top Digital Download. ↑ "Charts.org.nz – U2 – Desire". Top 40 Singles. ↑ "Norwegiancharts.com – U2 – Desire". VG-lista. ↑ Salaverri, Fernando (September 2005). Sólo éxitos: año a año, 1959–2002 (1st ed.). Spain: Fundación Autor-SGAE. ISBN 84-8048-639-2. ↑ "Swedishcharts.com – U2 – Desire". Singles Top 100. ↑ "Swisscharts.com – U2 – Desire". Swiss Singles Chart. 1 2 3 4 "U2: Charts & Awards: Billboard Singles". Allmusic. Retrieved 14 December 2009.